The ACS QUIK trial showed that a multicomponent quality improvement toolkit intervention resulted in improvements in processes of care for patients with acute myocardial infarction in Kerala but did not improve clinical outcomes in the context of background improvements in care. We describe the development of the ACS QUIK intervention and evaluate its implementation, acceptability, and sustainability. We performed a mixed methods process evaluation alongside a cluster randomized, stepped-wedge trial in Kerala, India. The ACS QUIK intervention aimed to reduce the rate of major adverse cardiovascular events at 30 days compared with usual care across 63 hospitals (n = 21,374 patients). The ACS QUIK toolkit intervention, consisting of audit and feedback report, admission and discharge checklists, patient education materials, and guidelines for the development of code and rapid response teams, was developed based on formative qualitative research in Kerala and from systematic reviews. After four or more months of the center’s participation in the toolkit intervention phase of the trial, an online survey and physician interviews were administered. Physician interviews focused on evaluating the implementation and acceptability of the toolkit intervention. A framework analysis of transcripts incorporated context and intervening mechanisms. Among 63 participating hospitals, 22 physicians (35%) completed online surveys. Of these, 17 (77%) respondents reported that their hospital had a cardiovascular quality improvement team, 18 (82%) respondents reported having read an audit report, admission checklist, or discharge checklist, and 19 (86%) respondents reported using patient education materials. Among the 28 interviewees (44%), facilitators of toolkit intervention implementation were physicians’ support and leadership, hospital administrators’ support, ease-of-use of checklists and patient education materials, and availability of training opportunities for staff. Barriers that influenced the implementation or acceptability of the toolkit intervention for physicians included time and staff constraints, Internet access, patient volume, and inadequate understanding of the quality improvement toolkit intervention. Implementation and acceptability of the ACS QUIK toolkit intervention were enhanced by hospital-level management support, physician and team support, and usefulness of checklists and patient education materials. Wider and longer-term use of the toolkit intervention and its expansion to potentially other cardiovascular conditions or other locations where the quality of care is not as high as in the ACS QUIK trial may be useful for improving acute cardiovascular care in Kerala and beyond. India is estimated to have the largest number of fatal acute myocardial infarctions in the world because of its combination of relatively high incidence and case fatality rates and its large population . In high-income country settings, implementation of guideline-based treatment has been associated with improvements in clinical outcomes. For example, the CRUSADE (Can Rapid Risk Stratification of Unstable Angina Patients Suppress Adverse Outcomes With Early Implementation of the American College of Cardiology (ACC)/American Heart Association (AHA) Guidelines) National Quality Improvement Initiative demonstrated that a 10% higher adherence to clinical performance measures across 350 hospitals studied between 2001 and 2003 (n = 64,775 patients) was associated with a 10% lower adjusted odds of in-hospital mortality . In countries like Brazil and China, randomized trials have demonstrated improvements in process measures using quality improvement toolkit interventions that include clinician education, reminders, and case manager training [3–5]. However, these trials were not powered to demonstrate improvements in clinical outcomes. In the Indian context, data collected from 2007 to 2009 for the Kerala ACS Registry (n = 25,748 patients) demonstrated gaps in optimal medical care as well as inappropriate care, such as delayed thrombolysis for patients presenting with non-ST-segment elevation myocardial infarction [6, 7]. Although pilot studies have demonstrated potential benefits of implementing quality improvement strategies , large-scale studies have not been carried out in India until recently. To address this gap in knowledge, the Acute Coronary Syndrome Quality Improvement in Kerala (ACS QUIK) cluster randomized, stepped-wedge trial was designed to develop, implement, and evaluate a quality improvement toolkit intervention to improve processes of care and clinical outcomes for patients with acute myocardial infarction . The ACS QUIK trial demonstrated improvements in process of care measures but did not demonstrate a reduction in the 30-day rate of major adverse cardiovascular events, defined by all-cause mortality, reinfarction, stroke, or major bleeding, in the context of improving background care during the trial. There was expected heterogeneity in the primary outcome across the participating hospitals. We performed a mixed methods process evaluation of the ACS QUIK trial to improve the understanding of the contextual factors that affected implementation, the relative usefulness of the toolkit intervention, and how the interaction of these influenced study outcomes. Mixed methods research employs rigorous quantitative and qualitative research involving multiple types of data (survey questionnaire, in-depth oral interviews, text-messages) to maximize the strengths and counterbalance the weaknesses of each data type and aids in real-life contextual understanding of a research problem from multi-level perspectives [10, 11]. Process evaluations using mixed methods are useful in multicenter trials involving complex interventions to explore physicians’ views of the intervention, understand which components of the intervention worked, and evaluate variation of the intervention effects among sub-groups. Exploring the context and potential mechanisms of action and relating these data with trial outcomes provide further evidence on the potential utility of the toolkit intervention. This has relevance for potential adaptation of the ACS QUIK toolkit intervention in other low-resource settings given the contextual differences and challenges in implementing the guideline-based treatments, which have been shown to be effective in high-income country settings. How was the toolkit intervention developed? What facilitators, barriers, and context were important for the toolkit intervention’s implementation and local applicability? What was the acceptability of the toolkit intervention among physicians? What was the interaction between context and underlying mechanisms to support the trial results (i.e., how and why the toolkit intervention improved process of care measures but not clinical outcomes?)? This mixed methods study included pre-trial toolkit intervention development (March 2011) using semi-structured interviews and focus group discussions and within-trial online survey data and semi-structured interviews with physicians (November 2015–December 2016) involved in the ACS QUIK trial. The analysis used both survey and interview responses to identify key factors influencing the success of the toolkit intervention components and to understand the interactions (underlying mechanisms) among the toolkit intervention components, local context, and trial outcomes. The ACS QUIK study methods have been described . In brief, the trial evaluated the effect of a quality improvement toolkit intervention based on American Heart Association’s Get With the Guidelines program across 63 participating hospitals in Kerala, India, using a cluster randomized, stepped-wedge trial design. Participating hospitals included private (n = 42, 67%), government (n = 9, 14%), and nonprofit (n = 12, 19%) hospitals. Each hospital identified at least two members of the quality improvement team to participate in this trial. Between November 2014 and November 2016, 21,374 eligible patients presenting with acute myocardial infarction were enrolled in the study. The primary outcome was the rate of major adverse cardiovascular events, defined as all-cause mortality, recurrent myocardial infarction, stroke, or major bleeding, at 30 days between the intervention and control groups, adjusted for clustering and temporal trends. To develop the ACS QUIK toolkit intervention, we conducted semi-structured interviews and focus group discussions with cardiologists and physicians who participated in the Kerala ACS Registry in English between May 2012 and November 2012. We purposely sampled and recruited 44 physicians or care providers (73% male; 43% cardiologist) using telephone and email invitations seeking a range of clinical experience and practice setting. Interviews and focus group discussions explored facilitators and barriers in the context of optimal ACS care in Kerala and were led by a cardiologist (MDH) and qualitative researchers (SG, DV). The audio recordings were transcribed, iteratively coded by two authors (MDH, KNK) until kappa > 0.8 to ensure agreement, and analyzed using Dedoose software v4.12 (Manhattan Beach, USA). 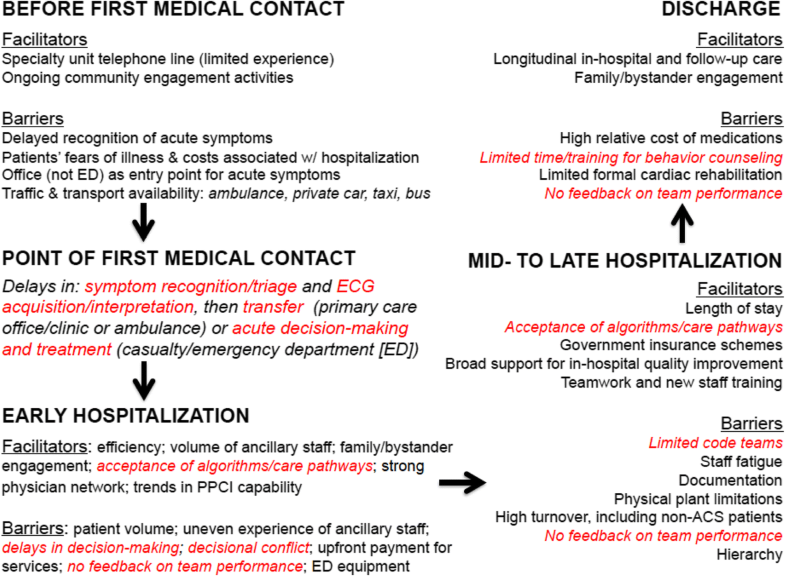 The framework method  was used to create a contextualized critical pathway for patients with acute myocardial infarction with opportunities for intervention highlighted (Fig. 1). We used high-quality systematic reviews [14–16] to inform adaption and implementation of previously reported strategies along with the results of the semi-structured interviews and focus group discussions to design the ACS QUIK toolkit intervention with the goal of improving processes of care and outcome measures . The toolkit intervention included (1) a monthly audit and feedback reporting system based on key data elements used by the American Heart Association and American College of Cardiology [15, 17], (2) standardized admission and discharge order checklists , (3) translated and culturally adapted patient education materials related to tobacco cessation, dietary advice, and physical activity, and (4) access to free online quality improvement training through the Institute for Healthcare Improvement and linkage to emergency cardiovascular care training because of the low prevalence of code teams among the participating hospitals. These teams included code blue teams to respond to patients with cardiac arrest or respiratory failure and rapid response teams to treat patients who are acutely decompensated but have not developed cardiac arrest or respiratory failure. We also created telephone messaging groups via WhatsApp Messenger (WhatsApp, Inc., Mountain View, USA) within each cohort to facilitate communication among hospitals randomized to the same intervention step. We sent quarterly newsletters to all site investigators to provide general trial updates. We generated monthly audit and feedback reports through the trial’s customized electronic data capture system (Data Template, Bangalore, India) with input from the research team for specifications and iterative testing. These reports were sent monthly via email to site investigators and included site-specific measures on performance, as well as hospital-level performance ratings compared to other hospitals in each cohort and all hospitals in the trial. A template of audit and feedback report is provided as online appendix. In-person trainings were scheduled and conducted with all hospitals within 2 weeks prior to the scheduled crossover from the control period to the intervention period. Quality improvement teams were comprised of at least two hospital physicians, nurses, cardiac catheterization laboratory technicians, or staff who participated in acute myocardial infarction care, including cardiologists, emergency department physicians, and house officers. The 120- to 180-min training sessions were delivered in-person by a team of cardiologists and project coordinators from Northwestern University, USA, Centre for Chronic Disease Control (CCDC), India, and Westfort Hi-Tech Hospital Ltd., India. Training focused on strategies to decrease inappropriate thrombolysis, increase use of inexpensive essential cardiovascular medications, and minimize delays in selection of reperfusion strategy among patients with ST elevation myocardial infarction based on formative research (Additional file 1: Figure S1). Each hospital’s audit and feedback report was reviewed in detail by the trial and site teams with training related to organizing and leading monthly quality improvement team meetings. The goal of the training was to increase the use of evidence-based treatment and to provide sites with the training and flexibility to adapt and implement the toolkit intervention to maximize local utility. Additional training to new staff or refresher training to existing staff was provided by one of three zonal project coordinators during the study period who provided local training, monitoring, and support for the trial. Onsite monitoring visits and central statistical monitoring were performed during the trial to ensure data quality and completeness. Surveys and interviews were performed at least 4 months after sites crossed over to the intervention period. Between June 2015 and December 2016, online surveys were sent to all 63 hospitals’ investigators at least 4 months after the site had crossed over from the control period to the intervention period to explore perceived benefits and overall satisfaction after a learning period. The instrument captured (1) whether the participating hospital had established cardiovascular quality improvement teams, (2) frequency of quality improvement meetings, and (3) familiarity, use, and adaptation of the individual toolkit intervention components. From November 2015 to December 2016, one of three interviewers (KS, RD MDH) conducted 28 semi-structured in-depth interviews of physicians from 27 hospitals in English, either in-person or by telephone. The interviews were also performed at least 4 months after the site had crossed over into the intervention period. We used purposive sampling to ensure that we had a diversity of physicians based on the hospital size, cohort, and number of patients enrolled in the trial. The interviews aimed to collect information on what parts of the toolkit intervention were considered useful, the context in which the toolkit intervention was most easily used, perceived benefits, barriers to toolkit intervention implementation, and sustainability and scalability of the toolkit intervention (Additional file 2: Sample interview guide). The interview duration ranged from 10 to 30 min. The audio recordings were transcribed verbatim. Online survey data were summarized using descriptive statistics. The mean and standard deviation are reported for continuous measures and frequency and percentages for categorical variables. Using a thematic framework analysis approach , a codebook was developed through line-by-line reading of every interview transcript and categorization of transcript sections into emergent themes. Coding was completed by two authors (KS, RD) using qualitative data analysis software (MAXQDA, VERBI GmbH, Berlin, Germany). The descriptive codes were revised as grouped into prevailing themes, and data segments within each of the codes composing a given theme were thematically analyzed. Emerging categories were compared within and between respondents in an iterative process. The patterns identified in the analysis formed an analytical framework; thematic saturation of the emerging framework was reached as we found fewer differences arising in patterns. Results of the thematic framework evaluation were set alongside results from the ACS QUIK trial to draw further inference about trial results. Physicians’ interview data, representing acceptability of toolkit intervention components (hospitals implementing all four toolkit intervention components were assigned a toolkit implementation score of 4, and those implementing any three, two, or one toolkit intervention components were assigned a score of 3, 2, and 1, respectively), were compared with changes in processes of care measures and clinical outcomes which occurred during the trial period. We performed an exploratory analysis of the trial’s primary outcome by restricting the sample to the 27 sites who participated in the process evaluation interviews. Mixed effect logistic regression was used to estimate the effect of the toolkit intervention on process measures and outcomes adjusted for cluster, temporal trends and high (three or four out of four toolkit intervention components) versus low or no (two or fewer toolkit intervention components) usage of the implementation toolkit intervention. For statistical analyses, Stata (version 15.0, Stata Corp), SAS (version 9.4, SAS Institute Inc.), and R (version 3.3.0, R Foundation) were used. Using a thematic framework analysis, we summarized the established relationships between the toolkit intervention components, underlying context, mechanisms, and related trial outcomes to offer a middle range conceptual model that is likely generalizable and could be tested in future studies. We received institutional ethics committee approval for the study from Northwestern University, Centre for Chronic Disease Control, participating hospitals, and the Cardiological Society of India-Kerala chapter (CSI-K) for hospitals without local ethics boards. All physicians provided written, informed consent prior to completing online survey and participating in in-depth interviews. Of the 63 participating hospitals, 22 physician site investigators (35% response rate) completed the online survey. We also interviewed 28 physicians (44%) from 27 hospitals who were selected from different cohorts with different hospital size and patient recruitment. Physicians’ mean (SD) age was 52.5 (11.1) years, 96% were men, 84% had sub-specialty training in cardiology, and 33% worked at the government hospitals. Fourteen (45%) physicians who responded in the survey or interview were from small size hospitals (hospital size by patient recruitment < 200 patients), followed by 26% from medium (201–500 patients), 19% from large (501–1000 patients), and 10% from extra large (> 1000 patients) size hospitals. Table 1 reports the summary of online survey responses from trial physicians. Of the 22 site physicians who completed the survey, 17 (77%) reported that their hospital had a cardiovascular quality improvement team. ACS QUIK toolkit intervention components were used by the quality improvement team, including physicians, at each participating hospital. Most (n = 18, 82%) respondents had read an audit report, admission checklist, or discharge checklist and reported using patient education materials (n = 19, 86%). However, low implementation of establishing code blue team (32%) was reported. Analysis of physicians’ interview data revealed four major themes (utility of ACS QUIK toolkit intervention, adaptations to the existing toolkit intervention, sustainability, and recommendations for future use). Summary of key themes along with physicians’ quotes as supporting evidence are provided in Table 2. Most physicians (among 84% cardiologists) reported the toolkit intervention was useful, but few could implement all four components. Although the educational materials related to diet, activity, and tobacco cessation were generally reported to be the most useful, physicians felt that their scope for impact was reduced due to high patient volume and patients’ concomitant family needs. Checklists were perceived as the next most useful component by respondents. Hospitals that could not coordinate or deploy a cardiac arrest or rapid response team reported that this was due to lack of coordination or support from different departments. Some physicians reported that the toolkit intervention made them more alert and efficient during transitions of care. Audit and feedback reports were sent via email to the hospitals’ site investigator every month but were reviewed by a minority of physicians (example report in the Appendix). Physicians expressed that, if the final study results demonstrated that a large proportion of patients were not prescribed optimal medical care, then an audit report might be helpful for physicians to investigate why these drugs were not prescribed. Physicians accepted that these reports added potential value in reviewing how their hospital performed compared with others in the study. When reviewing the audit report, physicians generally reviewed what proportion of patients received medical treatments and delays in treatment. Hospitals that were more likely to review the audit and feedback reports were also more likely to understand their relative performance compared with their peer institutions. The most common reasons mentioned by the physicians for not reviewing the audit report were time constraints, delegating responsibility to junior physicians, no patients enrolled in the study over the past 3 months, and slow Internet connectivity leading to a lag in data entry to make reporting contemporary. Physicians also expressed concern that their prescription rates for angiotensin-converting enzyme (ACE) inhibitors and angiotensin receptor blockers were generally low compared to global reports due to a perceived high prevalence of contraindications. Few physicians requested re-training of their hospital site staff to enable them to read, understand, and take corrective or proactive action by review of the audit reports. All (n = 28) physicians reported that checklists were considered important for overall team performance. Some respondents reported using their own hospital-specific checklist (treatment protocol) or discharge summary template or adapting the checklist to suit their setting. Others reported that checklists made minimal difference in their clinical practice. Some physicians asserted that even in the absence of checklist, they closely followed clinical practice guidelines in prescribing optimal medical care. Checklists appeared to be more helpful for less-experienced physicians, including trainees. Most physicians reported that patient education materials related to diet, physical activity, and tobacco cessation were displayed in the hospital and were routinely distributed and discussed with patients. Physicians reported that organized services for cardiac rehabilitation were not available at their site, which limited their use of cardiac rehabilitation materials that included home-based cardiac rehabilitation. Some hospitals employed a physiotherapist during the trial, but these service lines have yet to be fully developed for these patients in Kerala. Most (n = 24, 86%) respondents reported that their hospitals had not yet operationalized a cardiac arrest or rapid response team. Tertiary care hospitals that were staffed by senior cardiologists, residents, and physician assistants were less likely to find checklists useful. One physician criticized that there was no provision to add details on surgical procedures or angioplasty on the discharge checklists, which referred only to myocardial infarction or stroke. There were no major suggestions to modify the current toolkit intervention components, other than additional local adaptations to discharge checklists and dietary and exercise education materials. For example, one site added details of the surgery or other intervention procedures performed in the discharge checklist. Few sites modified the patient education materials to include information on the starting dose and step-up dose of exercise post-discharge and dietary recommendations on salt intake. Of the 28 physicians interviewed, 29% (n = 8) reported either use of existing materials or local adaptations of the ACS QUIK toolkit intervention to contextualize its components. The patient education materials and discharge checklists were most commonly modified. One physician reported implementation of other quality improvement measures during the study period, such as informal meetings in the department to review difficult cases, as well as random reviews of patient discharge summaries prepared by residents. Physicians also reported adaptation of the discharge checklist by expanding it to include medications for co-morbidities. All respondents agreed that hospitals should follow standard treatment protocols and guidelines for acute myocardial infarction treatment and management, including through the use of checklists. However, sites sought additional support from the coordinating center to help them implement the toolkit intervention components more consistently and reported that provision of educational materials would be the easiest component to sustain. Sites received payments for participation in the ACS QUIK trial (up to INR 750/US$12 per patient). Whether data collection and toolkit intervention implementation would continue without site payments remains uncertain. Some respondents identified the inherent nature of their clinical work as physicians as being an important driver for sustainability. Physicians supported the toolkit intervention concept and expressed interest in using the toolkit intervention component beyond the trial duration and were willing to recommend the toolkit intervention to other practitioners/hospitals, including in rural settings. Physicians had already shared the patient education materials that were given as part of the toolkit intervention to other consultants in a neighboring hospital. Tables 3 and 4 demonstrate the barriers and facilitators to ACS QUIK toolkit intervention implementation following synthesis of survey and qualitative interview data. Physicians’ belief and support from hospital administrators, usefulness and ease-of-use of checklists, and trial patient satisfaction with the care provided by the cardiovascular quality improvement team were the main facilitators identified. Hospitals that could not implement the toolkit intervention components reported problems such as change in hospital staff who were previously handling the program implementation and Internet connectivity problems. 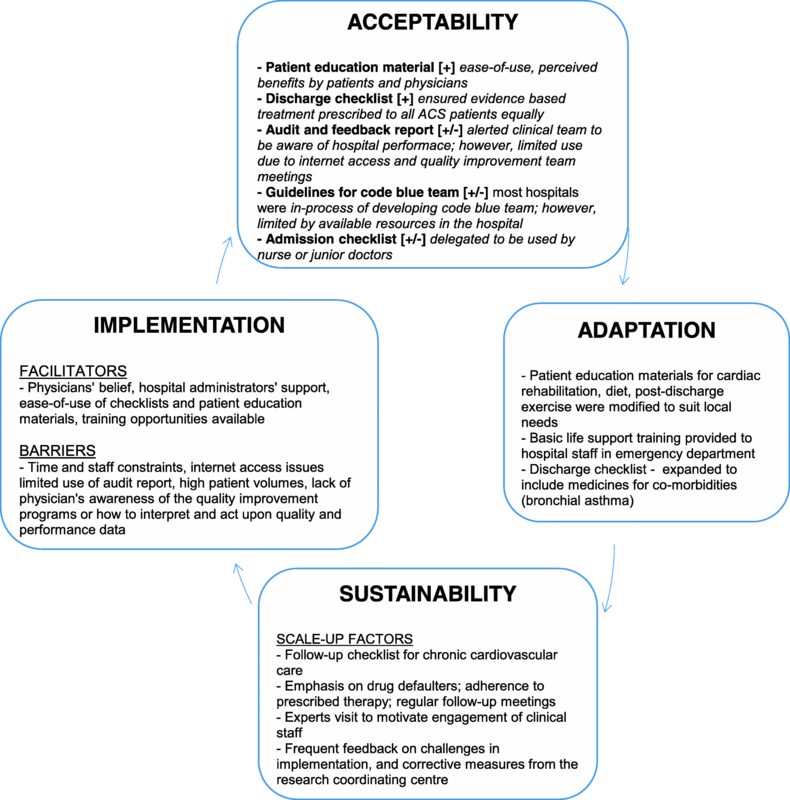 Figure 2 displays the conceptual framework for implementation, acceptability, adaptation, and sustainability of the ACS QUIK toolkit intervention. Physicians’ engagement in implementing the toolkit intervention was shaped by their interest with awareness and initial belief in the toolkit intervention that it will be beneficial to improve patient outcomes. In view of high patient volume and physicians’ time constraints, admission and discharge checklists were easy to administer and patient education materials were distributed to patients and their relatives in the outpatient clinic or at the discharge visit. Patients responded positively to the care provided by the cardiovascular quality improvement team. Physicians expressed that patients liked the education materials and care provided by the ACS QUIK trial team. Involvement of physicians, consultants and support staff from various departments viz. emergency unit, coronary care unit, and medicine department improved transfer communication and better delivery of toolkit intervention. Code (cardiac arrest) team and rapid response teams were established after training guidelines were provided to the hospitals. Training opportunities were made available to the hospital teams to create code and rapid response team to improve resuscitation procedures, door-to-needle or door-to-balloon time, and ultimately patient outcomes. Hospital administrators and physicians supported the view of delivering standardized treatment protocol to all ACS patients. Limited staff availability and frequent turnover in nursing staff affected continuity in delivering the toolkit intervention components and hence, its overall effect on patient outcomes could have been affected. Physicians did not fully understand the difference between drug trials and quality improvement translation trials. Because of lack of physicians’ awareness of quality improvement programs, the approach to the implementation of toolkit intervention suffered and there was inadequate response to audit reports. Due to slow internet access, there were lags in data entry and in accessing audit reports. Due to high patient volumes, physicians or support staff could not explain the patient educations materials including tobacco cessation, cardiac rehabilitation in as much detail as possible. Also, lack of coordination/support from various departments hindered the full implementation and delivery of toolkit intervention components, including changes to the clinical flow of patients with acute myocardial infarction. Physicians expressed that additional training to support staff could lead to improved delivery of toolkit intervention. Additional training to support staff on regular intervals was sought and received by the site physicians to improve delivery of toolkit intervention to account for frequent turnover of support staff. Few hospitals could not use audit reports in meaningful ways due to low patient enrolment rates, including low consent rates. Since the audit report summarized the hospital-level performance and measures based on patient data entered in the system, sites that enrolled few patients did not have meaningful indicators in the audit report. Among ACS QUIK patients (n = 12,686) enrolled by the 27 hospitals that participated in this mixed methods implementation evaluation, patients in the intervention phase were older, had a higher body weight, had higher fasting glucose and prevalence of diabetes, had lower rates of tobacco use and health insurance, were less frequently transferred from a different hospital, and had lower troponin, LDL cholesterol, creatinine, and hemoglobin compared to patients in the control phase (Additional file 3: Table S1). Sites that participated in the process evaluation, demonstrated lower major adverse cardiovascular event (MACE) rates in the intervention phase compared to the control phase, although the effects were attenuated after adjustment for cluster, temporal trends, and degree of toolkit intervention implementation (Additional file 4: Figure S2 and Additional file 3: Table S2). Sites that implemented 3 or 4 out of 4 toolkit intervention components demonstrated higher rates of process measures in the intervention group compared to control (Additional file 4: Figure S2 and Additional file 3: Table S3), and sites that implemented two or fewer toolkit intervention components had similar rates between the intervention and control groups (Additional file 4: Figure S2 and Additional file 3: Table S4). Table 5 demonstrates the toolkit intervention, contextual, and mechanistic factors that could have influenced the study outcomes, which are further categorized as either observed, implied, or anticipated based on this mixed methods evaluation. The key findings observed were improvements in processes of care measures, such as reperfusion among patients with ST-segment elevation myocardial infarction and prescription of in-hospital and discharge cardiovascular medications (aspirin, statins, and blood pressure-lowering agents) associated with the use of admission and discharge checklists. Since the ACS QUIK trial results were unknown during the conduct of process evaluation, we have only hypothesized contextual and underlying mechanisms, which could be tested in future studies. Audit report summarized the key performance indicators of hospital in comparison to other hospitals in the cohort and all the hospitals participating in the ACS QUIK trial. We hypothesize that monthly review of audit report stimulates clinical team to set goals to make changes that will improve processes and clinical outcomes. Clinical team used evidence provided in the audit report for 50–85% of their patients but quality improvement meetings were rare and changes in clinical practice based on these data were not identified. Admission and discharge checklists incorporated evidence-based guideline recommended treatment for acute myocardial infraction care at admission and discharge. Checklists enhance prescription of evidence-based treatment in-hospital and at discharge. Overall improved prescription of aspirin, beta-blocker and statins at discharge. Patient education materials were developed with a focus on tobacco cessation, diet, exercise and cardiac rehabilitation post-acute myocardial infarction. Patient education sped-up recovery post-event and reduce the risk of recurrent event. Education material may have enhanced patient self-care post-acute myocardial infarction. Guidelines and relevant training were provided to the team to establish rapid response and code teams. Development of rapid response and code team facilitated clinical team to do their work more efficiently and are therefore valued. Evidence will be considered more systematically across departments when policy is developed and implemented. This mixed methods evaluation of the ACS QUIK trial processes sought to describe the contextual development of the toolkit intervention, evaluate experiences and perceptions of physicians while implementing the trial, and explore facilitators, barriers, and context for implementation, acceptability, adaptation, and sustainability of the toolkit intervention. Our findings suggest that the presence of cardiovascular quality improvement teams, regular review of audit and feedback reports, checklists, regular quality improvement meetings and wider dissemination of patient education materials resulted in improved processes of care. However, a relatively high level of care at baseline in the control group hospitals (e.g., > 95% rate of discharge aspirin use), incomplete toolkit intervention implementation with a corresponding modest effect on process of care measures, and favorable temporal trends (i.e., background improvements in clinical care over the study period) limited the effect of the toolkit intervention on clinical outcomes. This mixed methods implementation evaluation of the ACS QUIK trial provides insights into the interaction between the toolkit intervention and its external context. We identified themes related to the quality improvement toolkit intervention’s integration of new activities into existing activities that changed behavior and performance through regular review. These findings may help explain both how the toolkit intervention operated and the mixed results of the trial. Mixed methods evaluation based on Medical Research Council’s framework provided a useful theoretical framework for this process evaluation by allowing a specific focus on context. Although complex interventions might appear “out of control” due to their varied manifestation in different situations, context-sensitive process evaluations can help identify interventions’ key functions. Our findings also indicate the need for concurrent investment in improving the structural capacity of hospitals to achieve optimal outcomes . The responsiveness of the pre-hospital environment [19, 20] and capacity of hospitals' emergency cardiovascular care services, essential structural prerequisites to deliver optimal acute myocardial infarction care, varied considerably among ACS QUIK trial hospitals. Lack of standardization of emergency cardiovascular care, limited funding, and insufficient numbers of qualified emergency staff have been identified as contributing to such variation. Similarly, systems and resources to support quality improvement varied across participating hospitals, including existing data capture systems, dedicated quality officers, effective management, and buy-in among hospital leadership. Future quality improvement initiatives will need to address these structural limitations without which substantial improvement in care is unlikely to be achieved. Our study provides unique data on the implementation factors, acceptability, adaptation, and sustainability of an acute myocardial infarction quality improvement toolkit intervention within a low- and middle-income country context. The mixed methods evaluation explored the context and the extent of adherence to the delivery of the ACS QUIK toolkit intervention and trial outcomes, the results of which suggest that higher implementers (three or four toolkit intervention components) had higher rates of process of care measure improvements but similar rates of the study’s primary outcome. These variations could be driven by differences in what was implemented (type of toolkit intervention component) and to what degree that led to meaningful change in outcomes, as well as differences in the sites (hospital size, resources), their teams, patients, baseline process of care and major adverse cardiovascular event rates, the way in which sites implemented the toolkit intervention (or not), or chance. One study from Brazil reported improvements in medication use and reperfusion among patients with ST elevation myocardial infarction with increased use of evidence-based treatment . However, this study did not evaluate the acceptability of the toolkit intervention from various stakeholders (providers, patients, or hospital administrators) perspective including physicians, patients, or hospital administrators. Another quality improvement trial among ACS patients in China (CPACS-2) performed qualitative evaluation and found that system-level barriers affected the ability of clinical pathways to change practice [4, 5]. A similarly designed trial in China that is powered to detect a potential difference in clinical outcomes has been completed and may help place results from ACS QUIK into broader context . Our results are consistent with these findings in highlighting the role of hospital administrators and leadership support for implementing quality improvement toolkit interventions. However, further research is required to understand how to evaluate and improve hospital management and leadership support and performance in low- and middle-income countries . Our study has several strengths. First, our mixed methods evaluation was built upon our previous observational study from Kerala ACS Registry and was executed in partnership with the Cardiological Society of India-Kerala Chapter. Second, we captured views and experiences of a range of settings (government, private, and nonprofit hospitals) prior to unblinding of the results and have created a model that is likely generalizable and could be tested in future studies. We used exploratory interviews with physicians to assess the context of implementing the ACS QUIK toolkit intervention prior to unblinding the ACS QUIK trial results. Therefore, our process evaluation collected information about trial context and mechanisms within those contexts at the time of the trial with neither the researcher nor the physicians being influenced by the trial results. Third, this mixed methods approach facilitated systematic examination of the empirical trial data along with interview data to build and adapt a middle-range conceptual model. The emergent theory helped us to develop an understanding about how and why the toolkit intervention was developed, incorporating the interaction between context and mechanisms, explaining the key functions of the toolkit intervention and how this translated to the study outcomes. Our study also has important limitations. Low participation rates in the online survey to assess acceptability of toolkit intervention provide a limited view on the overall acceptance rates and strategies to further improve toolkit intervention implementation. The process evaluation may also have been subject to social desirability bias among trial physicians. Measures were taken to reduce this likelihood, including (1) assuring confidentially and anonymity, (2) assuring respondents that their candid views would help towards improving the intervention in the future, and (3) their candor was critical for the larger cause of improving cardiovascular quality and safety in Kerala. Another limitation of our process evaluation was restricted to physicians, which is relevant since other healthcare workers may influence acute cardiovascular care quality and safety. Also, we did not have the trial results when undertaking the interviews, which may have limited the ability to probe for specific results and even response rates. Follow-up interviews with physicians after knowing the trial outcomes might have led to investigating specific drivers for neutral results and to exploring the factors that have influenced the study results. On the other hand, results may have biased physicians’ perceptions. Lastly, in our post hoc quantitative analyses, there could be potential unmeasured confounding between sites, site investigators, toolkit intervention implementation, and clinical outcomes, which are difficult to quantify or control. Implementation and acceptability of ACS QUIK toolkit intervention was enhanced by the hospital-level management support, clinical team enthusiasm, and ease of using checklists and patient education materials but was limited by time and staff constraints and understanding of quality improvement programs. Wider use of a similar toolkit intervention to other acute or chronic cardiovascular conditions (e.g., heart failure and stroke) or other locations where the quality of care is not as high as in the ACS QUIK trial may be useful for improving acute cardiovascular care in India and other low- and middle-income country settings. Cardiological Society of India Kerala Chapter Advisory Committee: G. Vijayaraghavan, Kerala Institute of Medical Sciences; Ashokan Nambiar, Baby Memorial Hospital; Geevar Zachariah, Mother Hospital; Rajan J. Manjooran, Pushpagiri Medical College; S. Sivasankaran, Sree Chitra Tirunal Institute of Medical Science and Technology. Trial Steering Committee: Dorairaj Prabhakaran (co-chair), Centre for Chronic Disease Control/Public Health Foundation of India; Donald M. Lloyd-Jones (co-chair), Northwestern University; K. Srinath Reddy, Public Health Foundation of India; S. Harikrishnan, Sree Chitra Tirunal Institute of Medical Science and Technology; Robert O. Bonow, Northwestern University; Darwin R. Labarthe, Northwestern University; Sidney C. Smith, Jr., University of North Carolina. Data and Safety Monitoring Board: Brahmajee Nallamothu (chair), University of Michigan; Thomas Alexander, Kovai Medical Center and Hospital; Karla Hemming, University of Birmingham; Simon Thom, Imperial College London; K.R. Sundaram, Amrita Institute of Medical Sciences; Lawton Cooper, National Heart, Lung, and Blood Institute. Operations Committee: Mark D. Huffman, Northwestern University; P.P. Mohanan, Westfort Hi-Tech Hospital, Ltd.; Raji Devarajan, Centre for Chronic Disease Control Abigail S. Baldridge, Northwestern University; Dimple Kondal, Centre for Chronic Disease Control; Lihui Zhao, Northwestern University; Mumtaj Ali, Public Health Foundation of India. Zonal Project Coordinators: Divin Davies, WestFort Hi-Tech Hospital; Prasad Arumugan, Caritas Hospital, Aneesh T.C., P.R.S. Hospital. This project was funded by the National Heart, Lung, and Blood Institute (R00 HL107749) with support from the Cardiological Society of India – Kerala Chapter, Centre for Chronic Disease Control, Northwestern University Global Health Initiative, and Northwestern University Clinical and Translational Science Institute (UL1TR001422). KS and MH have access to study dataset and statistical code. Any request for data sharing should be addressed to the corresponding author (MH). Data from the Acute Coronary Syndrome Qualtiy Improvement in Kerala are available through the National Heart, Lung, and Blood Institute’s Biologic Specimen and Data Repository Information Coordinating Center (BioLINCC). The funder had no role in the design and conduct of the study; collection, management, analysis, and interpretation of the data; preparation, review, or approval of the manuscript; or decision to submit the manuscript for publication. KS, SG, RD, PP, DP, and MH conceptualized and designed the study. KS wrote the first draft of the manuscript. AB, LZ, and DK performed the statistical analysis. MH, PP, KK, DV, DLJ, AB, LZ, DP, SG, RD, and DK contributed significantly in the revision of the manuscript. All authors have approved the submission of this version of the manuscript. This study was approved by applicable institutional review board and ethics committees. Also, written informed consent was obtained from the study patients and providers prior to the data collection. All authors approved the submission of this manuscript for publication to BMC Implementation Science. Mark Huffman (MH) has received support from the World Heart Federation to serve as its senior program advisor for the Emerging Leaders program, which is supported by unrestricted educational grants from Boehringer-Ingelheim and Novartis and has been previously supported by BUPA and AstraZeneca for work unrelated to this paper. MH also received support from the American Heart Association, Verily, and AstraZeneca for work unrelated to this paper. Dorairaj Prabhakaran (DP) has received support from the National Heart Lung and Blood Institute, Fogarty International Centre, National Cancer Institute, Wellcome Trust, Indian Council of Medical Research and research support from several pharmaceutical companies, but none that is directly related to this submission. The other authors declare that they have no competing interests.